The liver secretes bile, which is a mixture of bile salts and breakdown products (e.g., from blood). 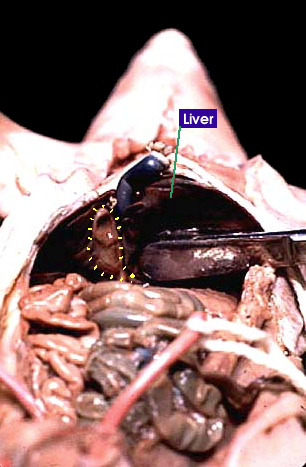 As it is secreted, it flows into the gall bladder for short-term storage (see dashed yellow circle). During digestion, the small intestine signals for the gall bladder to release the bile to aid in the digestion process. The bile is then released into the duodenum (anterior section of the small intestine) via a duct. Bile is not enzymatic; it serves as an emulsifier of fats to increase fat breakdown.